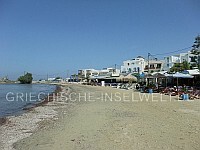 The Agia Anna beach lies to the west of Naxos, about 7 km south of Naxos town and is well to reach with the bus very. The beach is very beautiful, the sand is very bright and fine. You can rent sunshades und chairs. On the beach are several hotels and in the city Agia Anna you can get beverages and food. The city itself is not evolved, but a tourist site, and therefore not so beautiful. The beach of Agia Anna is one of the best-known beaches on Naxos and is really worth a visit, but there are more beautiful beaches on Naxos. The Agios Prokopios beach is about 5 miles south of Naxos city. Agios Prokopios is a very good, for example with the bus, to reach from Naxos city. The beach is one of the most beautiful on Naxos. The sand is fine and very bright and the water is fantastic. On the northern part of Agios Prokopio beach it is fairly quiet and there are no sunshades or chairs, but a few dunes… and it is not overcrowded. In the southern part, there are sunshades, chairs, restaurants and a small town, this part of the beach is full, but usually not crowded. The Pyrgaki beach is located in the southwest of Naxos, approximately17 kilometres from Naxos city. The beach is very nice and quiet. Pyrgaki is well suited for a relaxing beach day. There is nearly no shadow, so you have to bring your own sunshade. The beach is over 2 kilometers long and stretches directly south of Naxos town to the airport of Naxos. The sand quality is good and you have a nice view to the neighbouring island Paros. Sunbeds and parasols can be rented. It gets really crowded here in the season. The beach is located directly south of Naxos town. At the end of the harbour promenade you simply follow the road straight ahead and reach the beach in about 5 minutes on foot. The Agiassos Beach on Naxos, also written Aghiassos Beach, is the most southerly beach, which is well connected by good roads. The nicer part of the beach is in the beginning in the north. Here one can stay well protected from wind and from the sun under trees on the beach. The remaining part of the beach is missing some good atmosphere. Unfortunately, there is also a lot of kelp on the beach, which is in the early summer not removed. If you are looking for quietness this beach is just right for you, because it is very very quiet here. Some lodging facilities offer breakfast and some meals, such as the VRAHIA studios in the southern part and the STROUVALIS studios in the northern part. The nearest mini market is situated in the western part of the neighboring Pirgaki Beach. Until there it is about 3.5 kilometers. On this beach there is very little accommodation. VRAHIA Studios - located in the southern part of the beach. The studios are divided into 3 buildings, all with kitchenette and balcony or terrace. STROUVALIS Studios - located in the northern part of the beach, not directly on the beach, but only less than 100 meters away. All rooms have AC, TV and a small balcony. The beach is situated 22 kilometers south of the capital on Naxos. From Naxos town go best with a car or motorcycle passing Galando and Sagri Kato and Ano Sagri to Agiassos Beach. On this route the road is well developed. The alternative route via Pirgaki is between Pirgaki and Agiassos not so well developed. The Aliko beaches consist of several beaches of different sizes and small bays. The beaches have the finest light sand and gravel. The beaches can be roughly divided into northern, western and southern beaches. The southern beaches are well protected against the wind, often coming from the north. Here there is a longer beach and some small bays. They are all close to a hotel that failed years ago during the construction phase. The western beaches are probably the most impressive Aliki beaches. There are two longer beaches and small bays. The beaches here are bounded by small rock walls, which offer a certain protection from wind in jumps. The mixture of clear water, great sand, small rock faces and a very beautiful and lonely hinterland makes this part of Aliki a dream beach! The northern beach, rather wide and bordered by dunes, borders Glyfada Beach in the north. Plaka Beach is one of the longest beaches on Naxos. It lies between Agia Anna Beach in the north and Orkus Beach in the south. The approx. 3.7 km long Plaka beach has fine light sand and is bordered to the hinterland mostly by dreamlike, quite high dunes. The clear water, the sand, the dunes, the rather few hotels and a great sunset make Plaka Beach a dream beach. There is almost no natural shade. It's best to bring an umbrella. Food Drinking Plaka Beach Most restaurants are located in the northern to central part of the beach, directly on the road along the beach. There are four mini-markets along Plaka Beach, the northern part near Maragas Camping being the largest mini-market. The beach is about 7 kilometres south of the main town on Naxos. The distance to the beach is well developed. Along the beach the road is a very good dirt road. The beach is easily accessible by bus in the high season. In the low season the timetable is very limited. The Sahara Beach on Naxos is a dream beach on the west coast of Naxos. The beach is located south of the small village Mikri Vigla, between Parthenos Beach in the north and Kastraki Beach in the south. In the north the Sahara beach is bordered by rocks and merges seamlessly into Kastraki Beach. Light fine sand, great water, dunes and a lake behind the dunes form a dreamlike backdrop. The northern part of the beach is well protected from the wind. Climbing over a few rocks you reach a small very picturesque bay! The beach is about 16 kilometres south of the main town on Naxos. From Naxos town it is best to drive via Galando and Vivlos to Sahara Beach. On this route the road is very well developed. Alternatively, you can take the road along the coast via Agia Anna and Plaka Beach, but the road in the hinterland of Plaka Beach is narrow and not so well developed. The Parthenos Beach on Naxos is located north of the small village Mikri Vigla, between the Orkos Beach in the north and the Sahara Beach in the south. The excellent sandy beach of Parthenos is bordered to the south by rocks that separate it from the southern Sahara Beach. The beach has great light sand, which is bordered by the clear sea and dunes. Parthenos Beach is popular with surfers because of the excellent conditions. It is about 16 kilometres south of the main town on Naxos. From Naxos town it is best to drive via Galando and Vivlos to Aliko Beach. This track is well developed and the fastest. Alternatively, you can also drive along the coast via Agia Anna and Plaka Beach, but the road in the hinterland of Plaka Beach is narrow and not so well developed.